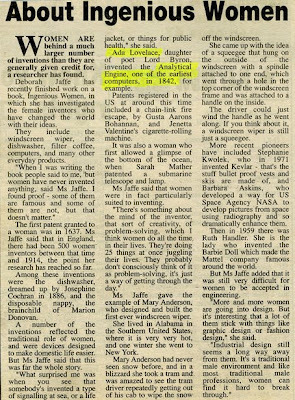 Ada Lovelace Day, bringing women in technology to the fore, was the the 24th of March. It was promoted & discussed amongst a number of technical types on the web at the time. Last weekend (April 18th) I came across the clipping below taken from a local newspaper in 2004. It gives a synopsis of a book published at the time. 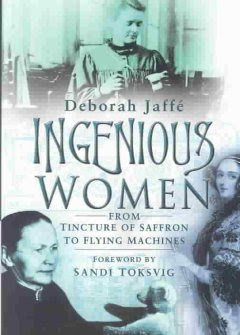 Ingenious women : from tincture of saffron to flying machines / foreword by Sandi Toksvig, 2004. The first woman to receive a patent was in 1637 in England between that and 1914 the were 500 patents granted to women. In the article the author of the article mentions a few women that Deborah Jaffe describes in her book. For more details click on the name. You will find some more inventions here, illustrations included when you click on the patent number. the illustrations are well worth looking at.